College football in the US has resumed. 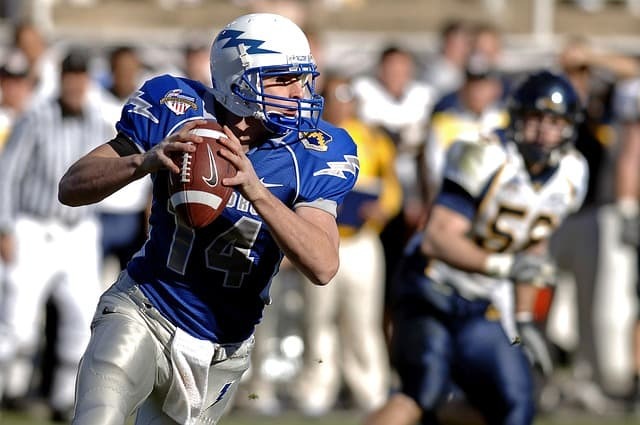 National Collegiate Athletic Association (NCAA) College Football creates a football hype every year that is probably only surpassed by professional National Football League (NFL) football. This fall, you can watch NCAA College Football games on Kodi as well as live online through other sources. In fact, you may be able to use a few official Kodi addons to do it as well. NCAA live games started again this year on Saturday, August 25th with UMass vs. Duquesne, Rice vs. Prairie View, Colorado State vs. Hawaii, and New Mexico vs. Wyoming. So far, games are being broadcast from a variety of sources, such as ESPN, CBS Sports, Stadium, Fox Sports, Pac-12 Network, ACC Network, Big Ten Network, and more. Different services and providers are carrying the networks you need as well, and some of those providers have Kodi addons you can use to watch the games. Some Kodi addon users may also be looking for free streams available from unofficial, third-party addons, such as Ultra IPTV, cCloud TV, SportsDevil, or other known addons. We do not recommend these options and will discuss why later. Whether you have Kodi installed on a Roku, Amazon Fire TV or Firestick, Raspberry Pi, iPhone, Mac, Windows PC, Nvidia Shield, Apple TV or Chromecast, you will be able to catch your NCAA on Kodi. Let’s go through your options for catching NCAA football on Kodi. See also: How to watch NFL on Kodi. The loss of Net Neutrality rules means that your internet service provider can filter, collect, and sell your private browsing data. Everything from what you watch to where you’re watching it can be gathered and sold for profit by your ISP. Ultimately, this means your ISP can see *everything* you do online and pick and choose what to sell or report. A good virtual private network, or VPN, however, will encrypt your internet traffic behind a private tunnel that even your ISP can’t break into and view. We’ve tested the top VPNs for security and privacy and IPvanish is our #1 choice for Kodi streaming. One thing you may find when using Kodi is that some addons don’t work to stream because of your location. Other addons may pose a security and privacy risk as well. Some of the options we’ll recommend below, such as DAZN, are completely legal and trustworthy to use but may require a VPN to get access to NCAA College Football. Other addons you may try to use could carry malware, or be a gateway for hacking through man-in-the-middle style hijacking. Regardless of whether the addon is from an official or unofficial source, all Kodi addons grant access to your system, making all addons a risk to use. You can protect your private streaming channels and bypass geographic content restrictions with a VPN. We recommend IPVanish as the best option for Kodi users. IPVanish is optimized for Kodi streaming and secure with military-grade encryption standards. It also has thousands of servers across the world, making it one of the best options for geo-hopping and accessing Kodi addon streams anywhere. IPVanish is our top recommendation, however, feel free to browse our full list of recommended VPN services for Kodi to get an idea of what else is out there. You’ll also find a mixture of other networks carrying games throughout the season. You can check for more details on here. The online streaming counterparts of these networks often broadcast games live as well. Such is the case with WatchESPN. Interestingly enough, Facebook will actually be streaming several games this year, as will Twitter. 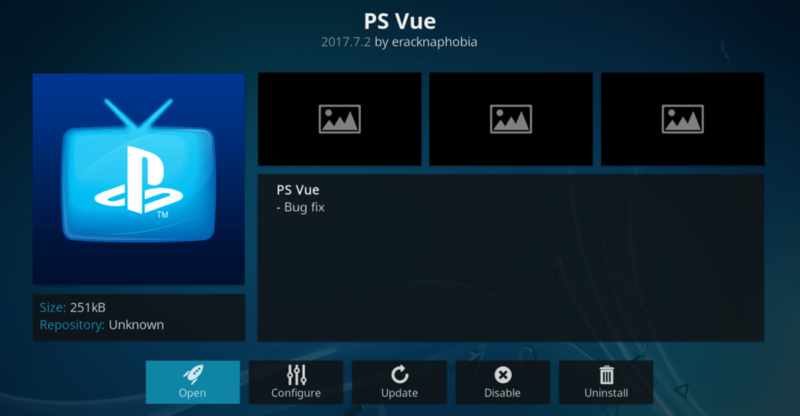 PS Vue is a Kodi add-on which allows users to access the PlayStation Vue service. It is available in the Official Kodi Add-on Repository. Playstation Vue is Sony’s live streaming TV service. It offers access to a wide variety of channels. Channels such as ESPN and ABC which show college football games are available through Vue. The service includes DVR capability and the ability to stream on up to five devices simultaneously. Playstation Vue requires a valid subscription and is only offered in the U.S. It is fully legal and offers viewers an alternative to a traditional TV service. This is quite intriguing considering Sony’s gaming background. ESPN 3 can be accessed directly through Kodi using the ESPN 3 Kodi add-on. If you are a football fan and want to catch the upcoming games then simply check the schedule to see when it’s showing on ESPN 3. You will need to have an active subscription through your cable service provider in order to access content through this plugin. ESPN 3 gives access to sports content legally and is one of our recommended Kodi add-ons. The ESPN Player Kodi add-on gives access to ESPN’s streaming service of the same name. In addition to the Kodi add-on, this service can be accessed on mobile devices as well as Mac and Windows computers. ESPN Player is available via subscription in Europe, the Middle East, and Africa. ESPN Player is a fully legal option and will allow you to access your favorite college football games as long as you meet the requirements of the ESPN Player service. USTVNow Plus is geared towards those serving in the US military but there isn’t much stopping others from signing up. It provides access to a few channels with its free package. You will have access to ABC, CBS, My9, CW, Fox, NBC and PBS with the basic free service. If you desire more channels, then you can upgrade to one of the paid packages which give access to more channels. However, you will be able to catch several college football games with just ABC on the free package. Visit the USTVNow website to get more information on the paid packages which start at $19 USD. USTVNow provides access to content via legal methods. It can be found in the official Kodi Add-on Repository. This is not the latest version available, however. For the very latest version, check the TVADDONS addons repository. See also: How to install USTVNow on Kodi. The Pac-12 Networks Kodi Add-on is a portal to all of the Pac-12 Networks. The PAC-12 networks are dedicated to displaying content related to the sporting teams of the NCAA Pac-12 conference. This naturally means that you will catch several football games here. Pac-12 Networks gives users access to legal streams. It can be found in the TVADDONS addon repository. DAZN is going to be one of the best options you’ll have to watch NCAA College Football on Kodi, but there is a catch. The only DAZN region currently offering NCAA sports is DAZN Canada. 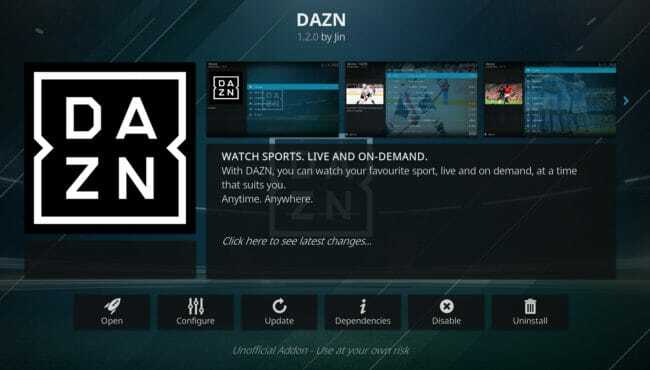 If you have a DAZN account, you can access DAZN Canada using a VPN. From our testing, a VPN will get you right into DAZN Canada but tends to fail in getting into other regions, like US or Germany. Nonetheless, as long as you have a DAZN account already, the DAZN Canada loads just fine and you can watch Pac-12 Networks games quite easily. You can install the DAZN Kodi addon from the Official Kodi Addons Repository. The free IPTV service Pluto.TV has a hidden gem in it: Stadium. Stadium is a free, live online TV broadcaster that carries a large handful of NCAA conference games throughout the season. You can get it through the Watch Stadium website, or view it right through the Pluto TV Kodi addon. Stadium won’t have the most games available, but it’s a good option to catch a good number of games during the season. 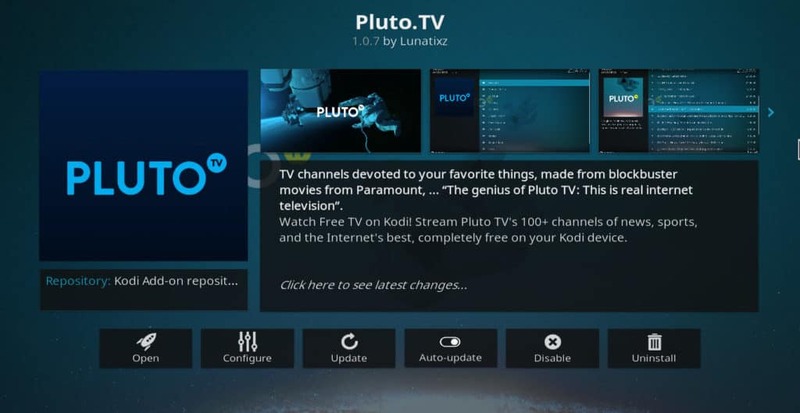 As this is a fully legal option, you can find the Pluto TV Kodi Addon in the Official Kodi Addon Repository. If you’re outside of the US, a VPN such as IPVanish will get you access to either Pluto TV and Stadium. Although these unofficial add-ons provide streams to anticipated NCAA football games for free, please bear in mind that they are not legal. Using these add-ons could run you into legal problems or into trouble with your ISP. Streams from these add-ons are also not as reliable as those provided via official add-ons. We do not recommend users turn to any of these add-ons for NCAA football streams. What is it? 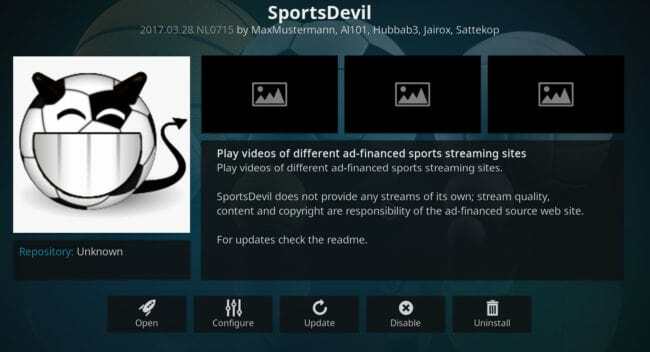 The Kodi Sportsdevil addon provides a collection of streams from across the internet for a variety of events. In addition, channels such as ESPN which broadcast college football can be found through Sportsdevil. Why should you avoid it? The streams provided by Sportsdevil are pirated and should be avoided. Sportsdevil is not one of our recommended add-ons. What is it? Ultra IPTV is an internet protocol TV addon that offers a large library of channels, including many that will be carrying NCAA sports. ESPN and other options are available through the addon. Why should you avoid it? There are many questions surrounding where Ultra IPTV is sourcing its streams. Not only is the service cheaper than every legal paid IPTV out thre, it’s also only available through a sketchy unofficial addon repository. As such, we do not recommend this option to Kodi users. What is it? cCloud TV is a community-driven IPTV service that allows users to access hundreds of free live TV streams from across the world. It happens to also include streams to popular networks like ESPN and FOX Sports. Why should you avoid it? cCloud TV has gone offline several times in the past. The app is now only available through a poorly-vetted repository and is not maintained by its original creator. It may also be providing streams without broadcasting rights. We do not recommend cCloud TV as a streaming source for NCAA Football. In order to install Kodi add-ons, the required repositories must first be installed. The add-on can then be searched for and installed. Alternatively, add-ons can be installed using .ZIP files. If you wish to learn how to install Kodi add-on repositories, feel free to take a look at an example of the process here.